A truly flexible backup plan should integrate seamlessly with servers and provide full support for all your business applications. It should enable you to protect assets around the country or overseas. And it should let you manage and monitor backups from anywhere. In short, it should give you everything you need—so instead of having to buy multiple solutions to support your changing needs, you can rely on a single solution that adapts to your environment. 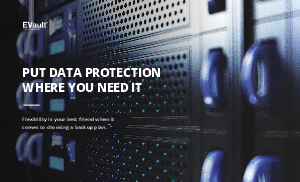 See how EVault business backup plans offer the flexibility you need to simplify operations in a heterogeneous IT environment.